The popular BMW X3Sports Activity Vehicle (SAV) is back with all-new 4- and 6-cylinder gas or diesel engine options. The new aluminum engine power will range from 184 to 313 hp and will be designed using BMW’s Twin Power Turbo technology. The small turbocharger compresses air first at low speed, pushing it past the larger turbocharger and in to the combustion chambers. This ensures a lossless development of charge pressure. During heavier throttle an electronic controller of the bypass unit engages the large turbocharger. Twin Power Turbo technology allows for an improved performance to fuel consumption ratio. The interior will include a high gloss black finished instruments panel and a panoramic moonroof for the xDrive35i. BMW will offer a variety of packages and options, including in-car internet access. Base price for the xDrive28i is $36,850. The x3 xDrive35i will retail for $42,400. Unfortunately BMW is not expected to release a diesel version to the US market. From its inception, the new BMW X3 has occupied the top slot among the competition by virtue of its compelling driving pleasure, convincing versatility and commanding presence anchored in high-calibre design and no-compromise premium quality. Now this successful Sports Activity Vehicle (SAV) is about to extend its lead even further on the efficiency front. 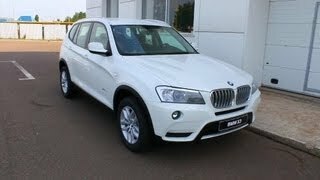 Autumn 2011 will see additions to the model range in the shape of the BMW X3xDrive20i and the BMW X3xDrive35d. All-new engines featuring BMW TwinPower Turbo technology endow both models with a further optimised performance to fuel consumption ratio. 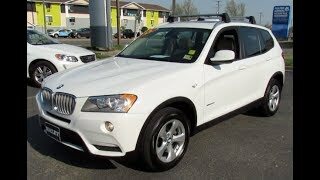 Added to which, the BMW X3 exudes even more appeal thanks to a fine-tuned range of standard equipment and special options. From autumn 2011, the new BMW X3 will come with a choice of three petrol engines and three diesel units spanning an output range of 135kW/184hp to 230kW/313hp. An exceptionally diverse portfolio of power units thus joins forces with the SAV’s outstanding agility – with intelligent BMW xDrive all-wheel drive as standard – and enhanced ride comfort. Thanks to a comprehensive range of BMW EfficientDynamics technology, including the Auto Start-Stop function that can be combined with both the six-speed manual and the eight-speed automatic transmission, the BMW X3 also achieves top ratings in its segment for fuel consumption and CO2 emissions. BMW X3xDrive20i: lively power curve and optimised efficiency courtesy of BMW TwinPower Turbo technology. 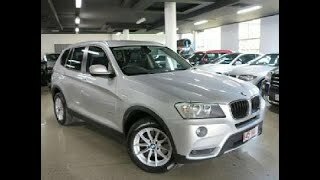 In autumn 2011 the BMW X3 Drive20i will be available as the new entry-level model among the petrol variants. Its newly developed 2.0-litre four-cylinder unit blends a hallmark BMW sporty power curve with exceptionally high efficiency. The new engine’s BMW TwinPower Turbo technology includes a turbocharging system based on the twin-scroll principle, along with High Precision Injection direct petrol injection, Double-Vanos variable camshaft control and VALVETRONIC variable valve control. Here the new powerplant takes its lead from the technology package of the 225kW/306hp multi-award-winning six-in-line unit of the BMW X3xDrive35i. Thanks to the use of aluminium, the powerplant of the BMW X3xDrive20i is particularly light in weight and reaches its peak output of 135 kW/184 hp at 4,800 rpm. Maximum torque of 270 Newton metres is already available at 1,250 rpm. The new BMW X3xDrive20i features a six-speed manual gearbox as standard with the option of an eight-speed automatic transmission. In both versions, the standard range of BMW EfficientDynamics technology includes, among other features, the Auto Start-Stop function, which automatically switches the engine off when the car is stationary at traffic lights or in congestion in order to avoid unnecessary fuel consumption when idling. Top athlete with BMW TwinPower Turbo technology: new six-cylinder diesel in the BMW X3xDrive35d. A new edition of the world’s sportiest six-cylinder diesel engine will deliver a particularly enthralling experience of driving pleasure in the new BMW X3xDrive35d from autumn 2011. The 3.0-litre six-cylinder in-line unit with BMW TwinPower Turbo technology drums up peak output of 230kW/313hp, reached at 4,400 rpm, making the BMW X3xDrive35d the most powerful variant in the SAV’s model range. With maximum torque of 630 Newton metres on tap from as low as 1,500 to 2,500 rpm, the new diesel engine also ensures impressive pulling power. The BMW TwinPower Turbo technology of the new all-aluminium unit comprises further advanced two-stage turbocharging (Variable Twin Turbo) and latest-generation common-rail direct injection. At low engine speeds the small turbocharger is deployed. The air it compresses is first fed past the larger turbocharger to the combustion chambers, ensuring lossless development of charge pressure. During heavier throttle application, an electronic controller of the bypass unit engages the larger turbocharger. Extremely spontaneous response is thus ensured by a power curve to match the relevant requirement. The injection system features precision solenoid injectors and maximum pressure of 1,800 bar to guarantee particularly efficient and clean combustion. 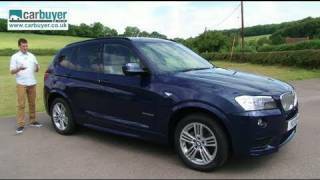 The BMW X3xDrive35d comes equipped as standard with the eight-speed automatic transmission including Auto Start-Stop. Greater variety in the equipment range too: the BMW X3 continues along its path of success. Thanks to its extended range of engines, the new BMW X3 now offers an unprecedented blend of superior driving characteristics and exemplary efficiency. It also scores with its versatile luggage compartment, providing as it does between 550 and 1,600 litres of space, as well as extremely high-quality and innovative equipment features. The new BMW X3 is the only model in its class, for example, to offer the option of a Head-Up Display and in-car internet access. For autumn 2011, an already diverse range of standard equipment and special options will be further boosted by a number of specific enhancements. The convenience of the Auto Hold function, for example, will be augmented by the automatic release of the electromechanical parking brake. The range of mobility services from BMW ConnectedDrive will likewise be extended. In conjunction with a navigation system, the Real-Time Traffic Information function will also be available for the new BMW X3 from autumn 2011. This innovative system provides particularly accurate and up-to-the-minute congestion alerts as well as information on the traffic situation on motorways, country roads and selected city routes. It allows the driver to take into account any potential loss of time resulting from a diversion when recalculating the route. As an added option on the interior design front, the trim elements on the instrument panel can now also be specified in High-gloss Black. 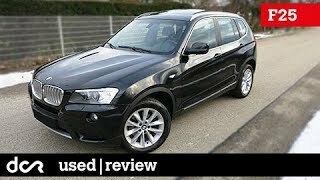 With its new engines and enhanced equipment range, the BMW X3 has the perfect prerequisites to perpetuate its success story. The extraordinary popularity of the SAV model is expressed not only in consistently strong demand, but also through positive feedback from recent reader surveys. In the poll for the “Four-Wheel-Drive Car of the Year 2011” conducted by car magazine Auto Bild Allrad, the new BMW X3 won from the word go. And that wasn’t long after readers of Off Road magazine had voted the Sports Activity Vehicle “Off-Roader of the Year 2011”.